Join as we welcome back Julie Morrison of Gluten-free Way for a lesson in gluten-free baking. We offer cooking demos every other week that feature chefs from all over the region. 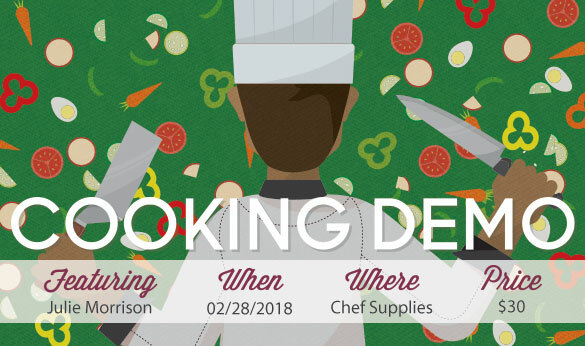 During each class, chefs present new techniques, delicious recipes, and quite a bit of entertainment. Whether you have a list of questions for our guest chefs or you’re just looking for a casual night out with friends, we hope to see you soon at Chef Supplies by KaTom.